Today i will discuss about ZTE OLT System Time Configure / NTP client configure. The ZXA10 C220/C300/C320 supports NTP and works as an NTP client. Step-2. 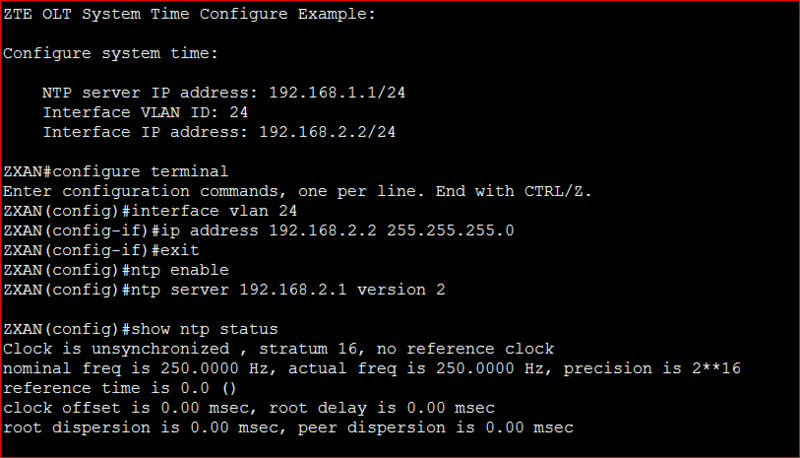 Use the ntp enable command to enable NTP. Step-3. Use the ntp server command to configure NTP server. Step-4. Use the ntp interval-time command to configure NTP synchronizing interval. Step-5. Use the ntp source command to configure source address of NTP synchronization. Step-6. Use the ntp alarm-threshold command to configure NTP alarm threshold. Step-7. Use the clock timezone command to configure system timezone. Step-8. Use the show ntp status command to query NTP status.